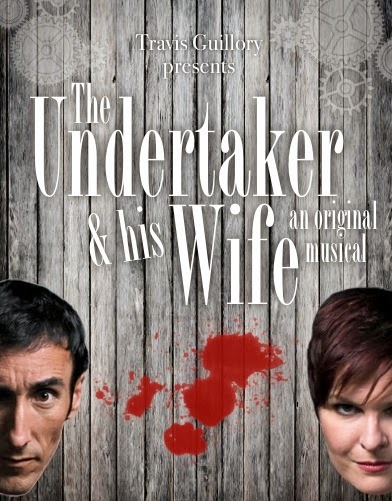 “The Undertaker &amp; His Wife” is an original dark musical comedy by Travis Guillory. With a cast of fifteen talented local performers decked in Victorian Steampunk garb and a multi-leveled set, this quirky new musical is sure to be a killer of a show. It’s Sweeney Todd meets The Addams Family meets Edgar Allan Poe meets Romeo and Juliet. Set in the dreary Victorian town of Hellingham, this twisted tale revolves around the madcap world of Phineas and Irene Cunningham, an eccentric undertaker and his zany wife. The couple use their occupation to kill people and stuff their corpses under the floorboards in order to save plots for more business. With the Hellingham population on the decline, the ominous Bishop Barkis is noticing a decrease in the collection bin at the church. He decides to venture out on a crusade against the Cunninghams as he suspects something fishy going on around their parlor. With Phineas and Irene trying to ward off the Bishop, their witty teenage daughter, Caroline, has fallen in love with a pauper boy, Tom. As the Cunninghams’ bizarre world begins falling apart, they devise a plan to murder the bishop and blame the pauper in order to get both of them out of the picture and away from the Cunnighams’ parlor. However, with their cheerfully chatty neighbor constantly barging in, their plan becomes more challenging than expected. This zany dark musical comedy explores the human side of being a monster and the subjective morality of being human. Performances are November 8, 9, 15, 16, 22, &amp; 23 at 7:30 pm and November 10, 17, &amp; 24 at 2:00 pm at Cité des Arts (109 Vine St., Downtown Lafayette). Tickets are $15 and can be purchased online at citedesarts.org or reserved by phone at (337) 291-1122. Like “The Undertaker &amp; His Wife" on Facebook at www.facebook.com/theundertakerandhiswife. NOTE: Some material may not be suitable for young children.